Hair loss is a common problem that is experienced by men and women all round the world. One of the most common types of hair loss is called Androgenetic Alopecia. Men as well as women suffer from this condition. Receding hairline is said to be found mostly in men. But it can take place in case of women also. When you suffer from severe hair loss, you may feel embarrassed to face people and you will start thinking that you have become less attractive. This can cause low self-esteem and confidence. Especially for women, hair loss is a frustrating experience. This is because hair is regarded as one of the beautiful assets of a woman. 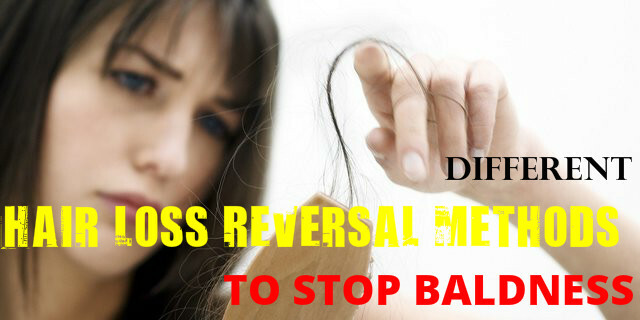 How to Reverse Hair Loss? Presently, there are only 2 FDA approved products and some surgical methods to help you reverse hair loss. Other than these, you can also try some herbal home remedies to fight against loss of hair. Aloe vera is very effective for hair loss. This is because it is a rich source of enzymes that help in healthy growth of hair. It can also maintain the pH of your hair and scalp. Aloe vera can make your hair stringer and lustrous, and also help in getting rid of dandruff. Take the gel from aloe vera leaf and apply it on your scalp. Leave it for several hours and then you can wash it off with warm water. Applying this 3 to 4 times a week can help in stimulating hair growth. You can also have it orally for making hair grow again. Castor oil is very beneficial for boosting your immune system. It has the ability to make your hair follicles stronger and helps in re-growth of hair. It is perfect for curly hair. All you have to do is to take some castor oil on your fingers and apply it on the hair and on the temple areas. Massage gently for a few minutes. Apply this oil on your hair twice a week for about 4 months. This can help you increase the volume of hair and regenerate hair growth. Fenugreek is an effective home remedy for hair loss problems. These seeds contain antecedents, which is a hormone that helps in rebuilding hair follicles and making hair grow properly. This is considered as one of the best home remedies for hair loss. Take one cup of fenugreek seeds and soak them in water overnight. Grind these seeds next morning to get a paste. Apply this paste on your scalp and hair and leave it on your hair for about 40 minutes. Applying this daily for one month can help in re-growth of hair. Mustard oil is very beneficial for reversing hair loss. To treat hair loss with this oil, take one cup of mustard oil and boil it. Now add 4 spoons of henna leaves to this oil. Leave it aside to cool. Massage the oil on areas where you can see baldness. Applying this daily can greatly help you to avoid hair loss and ensure better growth of hair. Richfeel’s Anagrow treatment is considered as a major breakthrough in the hair industry. In this treatment, a product called PCT Rejuva Max extract is injected into the hair follicles with a help of a machine. This extract can help you fight against thinning of hair. It is an excellent method to stimulate re-growth of hair. A team of scientists collected dermal papillae from various donors and cloned them in a tissue culture to conduct a study. Dermal papillae are cells that are found inside the base of hair follicles in humans. After a specific time period, the cells were transplanted on to the human skin. This made hair grow again within six weeks. According to study co-leader Angela Christiano, a dermatology professor at Columbia University Medical Centre, if it works in humans, many more people can follow this treatment to restore hair. You can use drugs like Minoxidil on the crown of the head rather than the sides and front to fight hair loss. This drug helps in retaining hair effectively. It also does not cause any side effects. Finasteride is also an effective drug like Minoxidil. DHT blockers can also help in treating hair loss and stimulating re-growth of hair. DHT is a substance that binds with the hair follicles. As a result, the growth of hair is prevented. DHT blockers help in reducing the amount of DHT on the scalp and stimulate the hair follicles, so that your hair grows better. Before you undergo this treatment, you may consult a dermatologist and take his/her advise. Gardson’s method of making hair grow is very popular and it has proved to be successful in the past. Hair roots get weakened when the hair follicles go dormant. This leads to hair loss. Once the follicles are dormant, they stop growing. As a result, hair starts to get thinner and leads to baldness. Gardson method helps in stimulating hair follicles and awakening dormant hair follicles, so that hair starts to grow. Insulin can interrupt with the growth of hair. When you take in diet rich in carbohydrates you suffer from Hyperinsulemia. You can solve this problem by having a well balanced diet and performing proper exercise regularly. Daily workout, particularly cardio workouts, can help in stimulating hair growth.